Last August, Richard Bell won the 2003 Telstra National Aboriginal and Torres Strait Islander Art Prize for his painting Science E Metaphysica (Bell’s Theorem) , which featured the words ‘Aboriginal art it’s a white thing’. When he accepted the prize he wore a black T-shirt with the slogan ‘white girls can’t hump’. The T-shirt caused an outcry. Bell roars with laughter when asked about this self-portrait and its clear reference to that occasion. ‘I’m not the artist who won the Telstra Award, I’m the guy who wore the T-shirt,’ he says. He admits he was bemused at the ferocity of the response, and suspects that this self-portrait will also create waves. 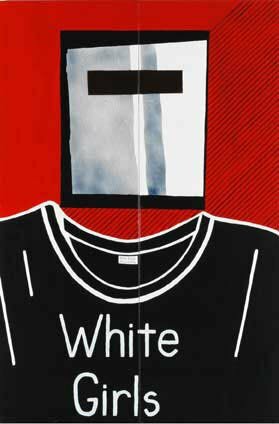 It was inspired by pop artist Roy Lichtenstein’s 1978 self-portrait, which featured an empty T-shirt and a blank canvas for the face. Lichtenstein’s painting was, in turn, a response to Magritte’s 1968 painting Le fils de l’homme of a suited gentleman with an apple in front of his face. ‘One of the issues I deal with is blamelessness.’ The label on the T-shirt features the names Edward Kelly,(‘to me Ned Kelly epitomises blamelessness,’ says Bell) and Retta Dixon, an Aboriginal children’s mission from the days that the Howard Government refuses to say ‘sorry’ for. Bell has never pulled any punches as an artist. He sifts complex issues such as violence towards Aboriginal women, the contested history of Aboriginal people, the exploitation of Aboriginal artists, and presents them in a few pithy words, which he has described as the equivalent of a 30-second sound bite. Born in Charleville, Queensland, in 1953, Bell now lives and works in Brisbane. A self-taught artist, he began painting boomerangs and tourist art but progressed quickly to using his art to express political views. His work has been exhibited in Australia, England, Austria, Canada and South Africa and is represented in public and private collections throughout Australia. Bell is the subject of David Paulson’s portrait Richard Bell, I am not sorry , also selected for this year’s Archibald Prize.